Campbells Diamond Special K is a fully water soluble, chloride free fertiliser containing the required nutrients for consistent growth and development of a range of plants providing immediately available nitrogen, potassium, phosphorus, sulphur, magnesium and trace elements. Diamond Special K is a soluble fertiliser alternative to dry spread complete fertilisers and can become the basis for a complete fertiliser program, especially where plants require additional potassium. The specific formulation of Diamond Special K is ideal for plants later in the growing season where size, quality or flowering is the main requirement. 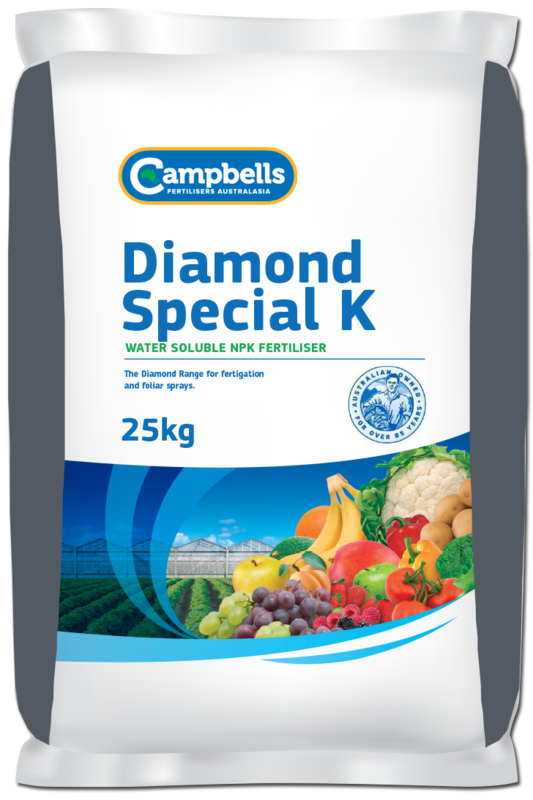 Campbells Diamond Special K is suitable for application via irrigation systems (fertigation) in soil grown crops and for foliar application. General fertigation rates for horticultural crops are between 25-70 kg/ha in field crops and approximately 1g/L in a hydroponic situation. When applying Diamond Special K through the irrigation system more frequently and smaller applications guarantee the nutrients are supplied to the plants without being lost due to leaching or excessive rainfall. Foliar applications at a concentration of 0.25-0.5%. A more complete nutrient program would include both Campbells Diamond Special K and Campbells Nitro-Cal, applied during alternate fertigations. As with any fertiliser program, it is best to seek advice from your Campbells Diamond Special K distributor or your local agronomist.